We are in the middle of a three-part sermon series on salvation. It’s based on the Andy Stanley book, “How Good is Good Enough?” and in our sermon series we are exploring the question straight from the title – how good is good enough? How good do we have to be to get into Heaven? What are the bare minimum requirements for making it into that place that Jesus promised us? It’s a popular theory that good people go to Heaven. I think it’s what makes us feel like we can get off the hook for not sharing our faith. Because how many of us know any non-good people? We may know people who need a little “adjustment” but do we have any non-good people in our lives – at least any we’d want to spend eternity with? Odds are probably not. It’s tempting to believe that a good God loves good people who do good things and rewards them by taking them to a good place. And even though I’m sure there will be lots of good people in Heaven, and even though it’s a concept that seems to make sense, it’s also one that has some pretty big problems as we discovered together last week. We came up with three of them. One – God didn’t tell us what qualifies as “good” enough. Two – Our internal barometer of right and wrong has changed so often over the years that we can’t rely on it as a measure of our “goodness.” And three – Christ’s standards of good are impossible for us. One – God didn’t tell us what qualifies as “good” enough. Two – our internal barometer is unreliable. And three – Christ’s standards of good are impossible for us. So we came to the conclusion that there really isn’t a good basis to believe that good people go to Heaven. As appealing as that theory is, it has too many holes. So I left you last Sunday with a quote from Andy Stanley. “Good people don’t go to Heaven. Forgiven people do.” Good people don’t go to Heaven. Forgiven people do. Let’s explore that this morning. We’re going to read from Matthew’s account of Jesus’ life this morning. So if you have a Bible or a Bible app on your phones, go ahead and go to Matthew 18:21. Matthew 18:21. Right before our passage, Matthew recounts Jesus telling the disciples about resolving conflict with one another. He talks about how important it is to heal those relationships and Jesus gives a step-by-step guideline for how to do that – confront one another personally, bring a friend to help resolve the conflict, bring the matter before the church. Jesus says we must do what we can to bring healing to our relationships. But this gets Peter thinking. And that’s always trouble. He asks Jesus, “Seriously, though. How often do I need to forgive someone? I mean, isn’t there a limit when we just write the guy off?” And that’s where we pick up Matthew’s account of what happened between the disciples and Jesus next. Then Peter came to Jesus and asked, “Lord, how many times shall I forgive my brother when he sins against me? Up to seven times?” Jesus answered, “I tell you, not seven times, but seventy-seven times. “But he refused. Instead, he went off and had the man thrown into prison until he could pay the debt. When the other servants saw what had happened, they were greatly distressed and went and told their master everything that had happened. Then the master called the servant in. ‘You wicked servant,’ he said, ‘I canceled all that debt of yours because you begged me to. Shouldn’t you have had mercy on your fellow servant just as I had on you?’ In anger his master turned him over to the jailers to be tortured, until he should pay back all he owed. Think about a time when you’ve been forgiven when you didn’t deserve it. Think about a time when you did something to someone that you shouldn’t have done and a simply “I’m sorry” was able to mend that relationship. More than anything, you probably remember the feeling of gratitude you had when it happened. Because forgiveness is powerful. It makes a powerful impact on our lives. 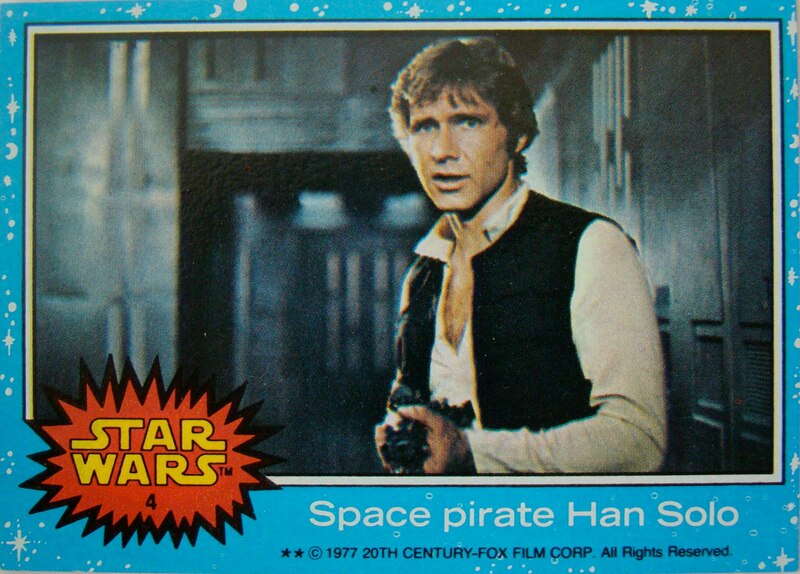 When I was young, we used to go to Shi’s Fish Market every week and they sold Star Wars trading cards. My allowance at the time was about $1.00 a week and so I’d buy two of the 50 cent packs. But every once in a while, Shi would have a new series come out and I’d want to get those, too. I’d ask my mom if I could borrow the money and she would often let me. But seeing as how I spent my allowance every week, it was hard to pay her back. As I got older, my allowance increased, but so did my spending, and often I’d have to “borrow” from my mom again. Going out for a bite to eat after the football game, heading to the bowling alley to play video games, all of those things cost money, too, and I found the hole I was digging was getting deeper and deeper and deeper. By the time I graduated from high school, I owed my mom about $700 dollars. $700 dollars. I just got my first job at Disneyland and already that summer’s money was going to be spent paying my mom back. Which meant that the big end of summer trip my friends had planned was something I wasn’t going to be able to go on. I was pretty bummed, but I didn’t see any way out. I had after all, promised my mom to pay her back and I hadn’t for way too long. Then one day, my mom calls me over to her desk and asks me when she’s going to see the money I owe her. I tell her that I’m working on it but only have about half of it. She looks up at me and says, “That’s okay. You keep it. Consider it a graduation gift from me and dad.” I was SO grateful! By every measure, my mom deserved to get that money. She had every reason to ask for me to repay it. And there was no way I could argue. But she forgave me my debt anyway. As a kid, $700 seemed like a vast fortune of money, especially for me. But it was all gone in an instant. I’m still grateful to her for that tremendous gift. Naturally, when I read this parable from Jesus, it struck a chord with me. 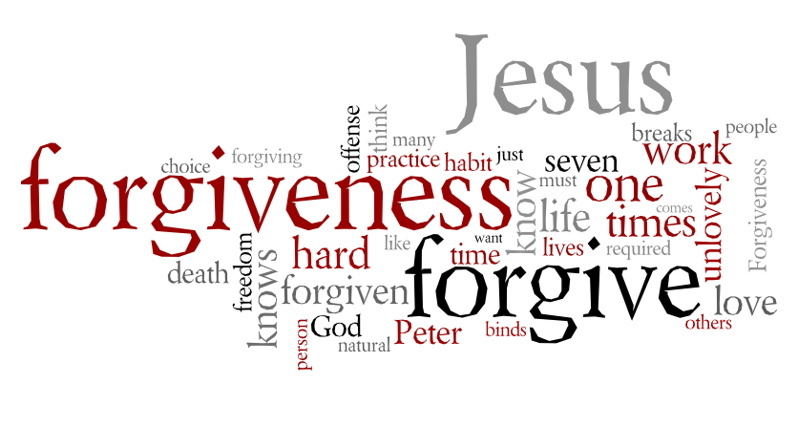 How similar Jesus’ message was for the disciples as was my mother’s act of forgiveness for me. Peter starts off though by asking how many times are we to forgive someone? Seven times? He must be thinking, “Seven? That’s pretty generous.” As human beings, we have a hard time with forgiveness. As hard as we try most of us prefer justice over mercy. Even our legal system puts limits on forgiveness. California has the harshest Three Strikes law in the country. It’s the only state where a third misdemeanor can count as a felony and can cost you 25 years to life in prison. So Peter’s question is one that many of us would ask. How often are we to forgive? But Jesus, as he often does, turns the expected answer on its head and says to Peter, “I tell you, not seven times, but seventy-seven times,” Not seven times but seventy-seven times! In fact, some translations say “seventy TIMES seven times.” (For you math whizzes, that’s 490 times – way more than 77). And then He goes on to tell Peter and the other Disciples the story we heard today because he wants us to understand the depth of forgiveness God has given to us. In the parable, Christ equates God to be like a king who forgives his servant’s debt of 10,000 talents. Without knowing what a talent is, it’s hard to gauge how much money that is, but today it would be the equivalent of about $9 BILLION dollars. Imagine that. Nine BILLION dollars. Forgiven. Just like that. The king knows, as God knows, that the servant could NEVER pay back that money and in an act of kindness forgives him his debt, as God forgives us our sins. But instead of being grateful, instead of remembering the mercy and forgiveness that his king just showed him, the servant instead goes out and immediately pesters a fellow servant for money that he’s owed, what amounts to $40,000. Compare that. Nine BILLION. $40,000. He was just forgiven $9 BILLION dollars but when the other man begs forgiveness the unmerciful servant has him thrown into debtor’s prison. And that’s why God is so angered at the servant. Was the man owed that money? Sure. But given the debt he had just been forgiven, the king was angered that the servant couldn’t show the same mercy to a fellow human being. That’s what it looks like to God when we can’t forgive those around us. We look like this unmerciful servant who quickly forgets how much we have been forgiven and we fail to forgive those who need it. Now we might think that we don’t owe God nine billion dollars. But the exact amount is not the point. Rather it’s the fact that we are people who keep disappointing God over and over. We keep borrowing against God’s good will, and we keep messing up. We might not actively seek to hurt others or to do things that would disappoint God, but we still do it. We go to Starbucks instead of giving a dollar to charity and having a cup of regular coffee. We ignore the homeless guy on the corner because we are skeptical and jaded. We don’t want “those kind of people” around because they make us uncomfortable or uneasy or because they are not our kind of people. Whatever the deed, we often make choices that disappoint God. They may seem little or insignificant because we like to compare ourselves with others, but whether it’s small or large, our sins place a distance between us and God. In a very small way, it’s like the debt I owed my mom. Even if she didn’t bring it up, I knew that I had not done right by her. Whenever the issue of money was brought up, even if it wasn’t about the debt I owed, there was this pang of guilt I felt each and every time. It felt uncomfortable and made me anxious. I needed her forgiveness to make it right. And that’s what happens to us when we turn toward God and ask for forgiveness. God repairs that broken relationship and makes it right so that we can be close to him again. And God calls on us to do the same thing with others. We need to forgive those around us. Whether it’s something small and insignificant or large and difficult, God calls on us to be a forgiving people in the way he has been forgiving toward us. The challenge for us this week is to forgive someone who does something against us. To really let it go. Maybe it’s something small like when your kids forget to put their clothes in the hamper. Maybe it’s something you’ve complained about over and over again like leaving the toilet seat down in the bathroom. Or maybe it’s something big. An argument you had with a sister or brother. A fight you had with a close friend that left you not talking to each other. This week I want to challenge you to let go of the small stuff and forgive all of these minor transgressions like socks and toilets. And I want you to pray about forgiving the big stuff. Because when we fail to forgive, we harbor bitterness, and bitterness grows like a disease. And the longer it grows the harder it is to let go of, and none of us need that in our lives. When we wonder if we have the strength to do that, to forgive as God has forgiven us, remember this story that Jesus told about the unmerciful servant and be reminded of the grace and goodness of a God who has already forgiven you. Because remember, “Good people don’t go to Heaven, forgiven people do.” In the name of the Father and of the Son and of the Holy Spirit. Amen.